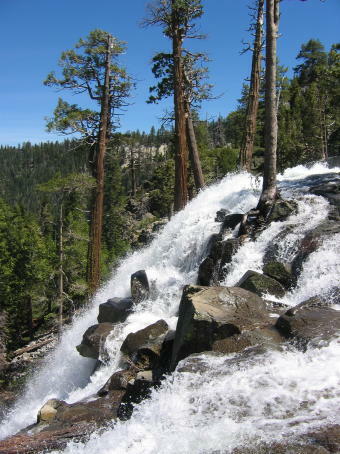 The best place to look at Emerald Bay is from Eagle Falls. In fact, from Eagle Falls every view of Lake Tahoe is magnificent. And, if you toss in the sublime beauty of the falls themselves, you’ve got a spectacular outing. Eagle Falls, which overlooks Emerald Bay, is another of those special scenic places that you discover just when you start feeling jaded about Lake Tahoe. The falls are easy to reach, located adjacent to Highway 89. To get there, you basically park in one of the nearby lots, then walk toward the sound of rushing water. Eagle Creek pours out of the trees from the westside of the highway and flows under the road. The creek feeds into several small pools before spilling over a steep, granite bench to Lake Tahoe below. The creek’s waters are cold and fresh; making the shallow pools inviting but chilly. From the top, you can look over the edge and see the creek waters rolling down the hillside. In the spring and summer, there is usually enough water that the falls form a three-tiered cascade. If you walk down the trail leading to nearby Vikingsholm (one mile from the parking lot), you can actually reach the falls from below, which offers an equally satisfying experience. Just beyond the ranger office (a brown log cabin), there is a short trail, about two-tenths of a mile, which leads to the bottom of the falls. The trail passes through firs and cedars, then ascends through aspen and alder, adjacent to the creek. Stairs lead you along the creek to a clearing at the base of Eagle Falls, which is a popular picnicking spot. If you park in the small lot on the opposite side of Highway 89 from Eagle Falls, you can find several trails leading to other, equally scenic locations. For instance, there’s an extremely short walk (half-mile from the parking lot) that leads to Upper Eagle Falls. This hike crosses Eagle Creek and includes a brief climb to a rock bench that offers a marvelous view of Tahoe from a slightly higher elevation. The trail is well-used and easy. It passes through a grove of aspens, which are particularly colorful in Fall, when the leaves turn gold. The hike requires an easy climb on rock steps, which leads to a large, metal bridge that spans Eagle Creek. After crossing, the trail leads to a smooth, rock clearing that offers yet another great view of the lake. Additional good views can be found above this spot on granite perches located along the trail. From here, the trail continues for another mile to picturesque Eagle Lake, located within the Desolation Wilderness. The latter is a unique, undeveloped expanse, located west of Lake Tahoe, that is a popular hiking region. If you plan to enter the Desolation Wilderness area, you must obtain a permit at the trailhead at the parking lot. Because of its popularity, there is a limit on the number of people allowed to spend the night in the wilderness (700 per day). It’s a good idea to contact the Forest Service in advance if you’re planning an overnight stay. The Desolation Wilderness earned its rather ominous name because of its vast stretches of exposed granite and barren, windswept peaks. Despite the name, however, the wilderness area is actually a very beautiful and scenic region. You’ll find the wilderness isn’t all that wild or remote—chances are you’ll encounter plenty of people on its trails. But it’s worth a visit because within its 63,960 acres you can find about 130 lakes and lots of remarkable, glacier carved scenery. For more information about the Desolation Wilderness go to www.fs.fed.us/r5/eldorado/wild/deso/. To obtain a permit in advance, contact the Lake Tahoe Basin Management Unit, 35 College Drive, South Lake Tahoe, CA 96150, 530-543-2600 or pick up a permit at the Taylor Creek Forest Service Visitor Center on Highway 89, 530-543-2674. For eighteen months, a group of brave, young men regularly rode more than 2,000 miles from St. Joseph, Missouri to Sacramento, California. Their job was to deliver mail and they were part of the Pony Express. Despite the fact that it existed for such a short time, from April 3, 1860 to October 28, 1861, the fame of the Pony Express has endured. In fact, the National Park Service is exploring the possibility of designating the route as a national historic trail. Its demise was guaranteed four days before it closed by the completion of the first transcontinental telegraph wire. In Nevada, the Pony Express route crossed the center of the state. The western half of the original route was roughly parallel to modern-day Highway 50 from Carson City to Austin. East of Austin, the route veers north of Highway 50 to the Ruby Marshes and into Utah. Within Nevada, there were approximately 30 Pony Express stations. Few of the stations were built for permanence, so little remains of most of the sites. However, explorers can find a few places that offer an intriguing glimpse into the difficult life of the Pony Express riders. The stations were important to the riders because the were places to change horses, replenish supplies and pick up news before riding off to the next stop. The western-most Nevada Pony Express station was a place called Friday's, located a mile east of Stateline at Lake Tahoe. The original blacksmith shop still stands, but is not open to the public because it sits on private land. Just over the Sierra was the next stop, Genoa. The old post office in Genoa was used as the Pony Express station. The building has long since disappeared and today, the site is the vacant lot south of the courthouse. From Genoa, the rider headed to Carson City. The original station is gone, but records show it was located on Carson Street between 4th and 5th streets. The next stop was in Dayton to a place called Spafford's Hall Station. That site is now a gravel pit (an historic marker just north of the downtown indicates the location) and a second Pony Express station was built on the site of the present Union Hotel. From here, only a few of the remaining sites contain much to see, including three sites that offer the best ruins of the original stations. 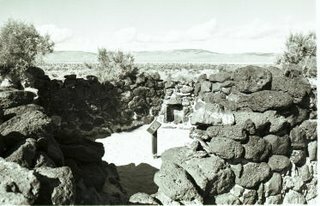 One of those sites is Fort Churchill State Park, a Civil War-era fort that was built to defend Nevada settlers from hostile Indians. The fort also served as a visible reminder during the Civil War to the Confederacy that Nevada was part of the Union forces. Further east is the Sand Springs Station, located south of massive Sand Mountain. Visitors here will find well preserved walls from the stone station that once provided a refuge to the riders (albeit an extremely dismal one). The site was excavated by University of Nevada, Reno archaeologists and is listed on the National Register of Historic Places. About 30 miles from Sand Mountain is the Cold Springs Station, which many consider the best preserved of the ruins. Located about a mile and half from Highway 50 (there is a wooden informational kiosk at the trailhead), the station has been studied by archaeologists and partially restored. It is also listed on the National Register. We happen to know a bit about the Sand Springs and Cold Springs stations because both were included in a diary written in 1860 by British explorer Sir Richard Burton, who traveled the Pony Express route. Of Sand Springs, Burton said the "land is cumbered here and there with drifted ridges of the finest sand, sometimes 200 feet high and shifting before every gale....The water near this vile hold was thick and stale with sulphury salts: it blistered even the hands." Cold Springs was slightly more enticing, according to Burton, who described it as "a wretched place half built and wholly unroofed....Our animals, however, found good water in a rivulet from the neighboring hills." The three best Pony Express stations to visit are: Fort Churchill, located 40 miles east of Carson City via Highway 50 and Alternate Highway 95; Sand Springs, located 25 miles east of Fallon, then a half mile north of Highway 50; and Cold Springs, located 52 miles east of Fallon, then a mile and half hike south of the highway. In the mid-1920s, Nevada Governor James G. Scrugham decided the time was right to create a system of state parks. He issued a proclamation listing 15 potential “State Recreational Grounds and Game Refuges” and signed a bill allowing the state to trade state owned land for federally owned sites that could be used for recreation. While four of those sites eventually became state parks—Valley of Fire, Cathedral Gorge, Beaver Dam and Fort Churchill—three never became state parks and have nearly disappeared from most recreational maps. So what were the Hidden Forest, the Petrified Forest and the Opal Fields? And why were they once considered important enough be mentioned on the initial list of future park areas? Historical records are sketchy. When Nevada formally created the state park system in 1935, four sites were designated including Valley of Fire, Cathedral Gorge, Beaver Dam and Kershaw Canyon (known as Kershaw-Ryan State Park). Fort Churchill was being stabilized for future consideration as a state park. But no mention is made of the other three sites. However, a review of old state park records and other sources reveals a bit more. A 1938 report, “Park, Parkway and Recreational Area Study,” prepared by the Nevada State Park Commission, includes a map of “potential” state park areas. Among the places listed are: “Petrified Forest,” now located in Esmeralda County near the Fish Lake Valley, “Opal Fields,” now in Humboldt County near the Black Rock Desert, and “Hidden Forest” in Clark County near the Sheep Range. 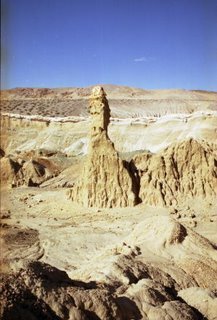 In all likelihood, the county locations of the Petrified Forest and the Opal Fields had been reversed in the earlier legislative description. With this knowledge and maps of their locations, the significance given to the three sites become easier to understand. The Petrified Forest site was most likely the area now known as “the Sump,” a large drainage gulch, once the bottom of a prehistoric lake that contains the remains of ancient petrified tree stumps and twigs. It is located a few miles from the intersection of State Routes 773 and 264. This remote site remains an impressive geologically significant place with its otherworldly appearance enhanced by massive multi-colored cliffs. Over the years, a number of folks have suggested it be designated a park or protected area because of its relatively untouched natural beauty but to date no action has been taken. Interestingly, there is a Petrified Forest site in Northern Washoe County near its border with Humboldt County. Called the George W. Lund Memorial Petrified Forest, it is a Bureau of Land Management preserve that contains the fossilized remains of about 250 tree stumps buried by volcanic ash 15 million years ago. Unfortunately, the site was unprotected for many decades and, according to a 2005 report of the Botanical Society of America; bulldozers and dynamite have removed some of the stumps. Additionally, the BLM is studying means to minimize the effects of freezing and thawing of the remaining stumps. A large portion of the site, which is adjacent to Nevada Stare Route 34, about 35 miles north of Gerlach, was fenced in 1965 by the BLM and a small monument was erected. 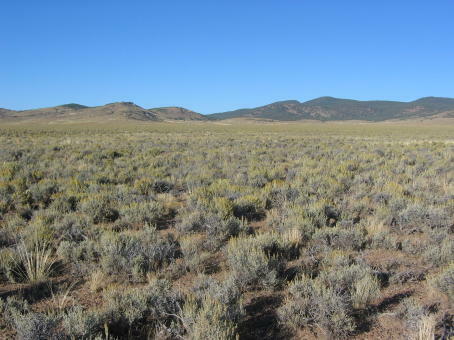 It is believed that the second forgotten park site, the Opal Fields in Humboldt County, most likely referred to the Virgin Valley, located west of Denio in far Northern Nevada. This region is famous for its black fire opals—the world’s largest example, the 2,665-carat Roebling Opal was discovered here in 1917. Since the Virgin Valley has long been an active mining district—opals are still mined there—this may have been an erroneous suggestion because much of the area was and remains privately owned. The last site, Hidden Forest, is tucked in a fairly remote part of Clark County. 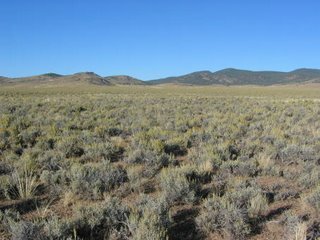 The Forest is just west of the Sheep Range, west of U.S. 93, near Alamo. The region gained its tantalizing name because it contains a hidden ponderosa pine forest—and it’s fairly unusual to find such trees in this part of the state. This area has been designated part of the Desert National Wildlife Refuge, meaning it has some level of protection. The forest sits on a ridge that can be reached by hiking on an old dirt road (called Hidden Forest Road). About six miles from the trailhead, there is an old log cabin, the Hidden Forest Cabin, which is an old game warden’s dwelling that is listed on the National Register of Historic Places. A few minutes from the cabin is a spring (be sure to filter the water before you drink any). When asked, staff at the Nevada State Library and Archives indicated they didn’t know why none of the three sites ever made it to park status. However, there is an historic photo taken in 1926 that shows Governor Scrugham standing amidst the giant trees in the Hidden Forest. If he were still alive, he’d probably also be perplexed as to why three of the initial seven proposed park sites never quite made it. For more information about any of these sites, consult with a good map atlas, such as the DeLorme or Benchmark books. All are located in remote parts of the state, so be sure to be prepared with the right kind of high clearance vehicle as well as plenty of water and food. That perfectly describes Nevada’s Monitor Valley. Situated in the geographic center of the state, about halfway between Austin and Eureka, the valley is a long, narrow stretch of land that is bordered by the Monitor Range on the east and the Toquima Range on the west. The valley is about 70 miles long and perhaps ten miles wide and runs in a north-south direction. While no paved roads run through it, there are a number of maintained dirt roads that are drivable in a four-wheel drive or high clearance vehicle, particularly in the drier months, including Monitor Valley Road (State Route 882; also called the Old Belmont Road), which runs through the center of the valley from U.S. 50 (at the north end) to the mining town of Belmont (the southern point). The Monitor Valley Road, accessed from U.S. 50 at a point about 25 miles from the intersection of U.S. 50 and State Route 376, offers a chance to literally escape from the modern world. This ribbon of packed gravel and dirt leads deep into a landscape more noteworthy for what is not there than for what is there. The journey takes you through spectacularly empty country that is the essence of Nevada’s high desert beauty. This a terrestrial canvas painted with subtle shades of soft green, delicate brown and yellow and muted blues and grays. The road passes the actual geographic center of Nevada (at about the 13-mile mark) and continues toward the fairly extensive ruins of the Potts Ranch. The ranch was apparently established in the 1870s by William Potts and became one of the larger cattle operations of the time. In the late 1890s, it gained its own post office. The ranch, however, was sold in the 1940s and the buildings appear to have been abandoned since then. Today, you can still see the remains of an impressive, two-story ranch house, a couple of stone storage buildings, and the foundations and walls for a handful of other structures. The ranch, which remains a functioning cattle operation—so respect the fact it is private property—also contains hot springs, several of which consist of steaming ditches or holes filled with scalding hot water covered by a layer of green algae. During our drive, we stopped near the ranch to admire the spectacular views of the sagebrush-dotted valley and sloping mountain ranges. In the stillness of the late morning, it was easy to imagine what it must have been like to live or work at the Potts place a century ago. A special surprise was driving a bit farther and stopping to watch a herd of wild horses. About a dozen brown, black and white mustangs grazed peacefully, ignoring us as we snapped a few photos. We intersect with another road, which leads to the west. This is the route that leads into the Toquima Range to Toquima Cave, one of the best sites of Indian pictographs in the state, before dropping down into the Big Smoky Valley. Resuming our journey, we continued by the alkali mound that is the site of Diana’s Punch Bowl. At the top of the hill is the large opening—the Punch Bowl—that contains bubbling hot geothermal water. From here, the main road passes by several smaller roads that lead to isolated ranches, some fairly large. Both right and left are the mountains that, with their various peaks, cliffs and undulations, hint of hidden, secret places waiting to be explored. The road gradually drifts to the west as it heads toward the once-bustling mining town of Belmont. The first indication that civilization is around the corner is when you pass the ruins of a large brick-manufacturing plant. The site contains the large foundations and walls of the factory as well as a tall, red brick smokestack. From here, the road meanders by some newer homes as well as dilapidated wooden shacks before it drop down into Belmont and out of the Monitor Valley. Despite the fact that Belmont only has about a dozen or so residents, it seems crowded compared to where we’d just been. Over the years, Nevada has experienced the loss of natural landmarks, scenic wonders, and native species of plants and animals. In some cases, the damage was on purpose but in others it was the unintended result of another action. The Nevada Natural Heritage Program estimates that nearly two-dozen varieties of fish, amphibians, birds and mammals that once existed in the state are now extinct. Yet despite these losses, it is fortunate that Nevada is so relatively undeveloped because that has helped keep some of its more fragile natural sites and environmentally sensitive native species in fairly good shape. 1. Ironically, one of Nevada’s most abused places has still managed to remain among its most scenic and beautiful spots. Lake Tahoe is a spectacular destination despite what might best be described as decades of exploitation in the 19th century. Starting in the 1860s, Lake Tahoe’s magnificent forests were chopped down to provide fuel for Virginia City’s mills and timber to shore up its underground silver mines. By the late 19th century, most of Tahoe’s slopes were nearly completely stripped of trees. Still, at the turn of the century there were proposals to create some type of national preserve at Lake Tahoe. When the National Park Service was created in 1916, Lake Tahoe was on the short list for becoming a national park. Thus ended the dream of Lake Tahoe National Park. 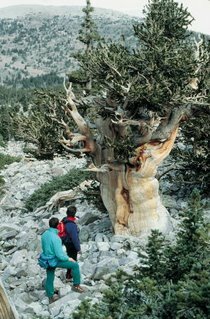 In 1964, a young geographer, Donald R. Currey, a doctoral student at the University of North Carolina, was given permission by the U.S. Forest Service to study the Bristlecone pines growing in a grove at the base of Wheeler Peak in Eastern Nevada. In particular, Currey was interested in studying the rings inside of these ancient trees, which had only been discovered a few years earlier. Researchers had identified Bristlecones in the White Mountains of California as being as old as 4,000 years. Currey’s research specialty was Ice Age glaciers and he hoped that Bristlecone tree rings might provide some insights about the conditions in prehistoric times. One of the trees in the Wheeler Peak grove appeared to be extremely old and it was Currey’s desire to extract tree rings that could help him with his research. The Forest Service gave Currey permission not only to take core samples from several of the oldest-looking Bristlecone trees, but also to cut down one of them to measure its age. Bristlecone trees often grow in a twisted fashion. Also, it’s not uncommon for one section of the tree to die off even a couple thousand years before another part. This means it can be difficult to locate the oldest part of the tree in a core sample. The tree that Currey chose to cut down in 1964—still living at the time—contained about 4,900 growth rings, making it the oldest tree in the world at the time of its demise. 3. Until the late 1930s, Pyramid Lake had a twin—Winnemucca Lake. Located directly east of Pyramid Lake on the other side of the Lake Range, Winnemucca Lake was a long, narrow finger of water that at the end of the 19th century was as long as Pyramid but about half as wide. Filled with tule reeds, Winnemucca Lake was an important stop for migrating waterfowl. In 1936, it was designated the Winnemucca Lake National Wildlife Refuge because it served as a prime feeding area for white pelicans. However, Winnemucca Lake was a “terminal” water body, meaning that it sat in a closed basin and did not empty into some other body of water or river. 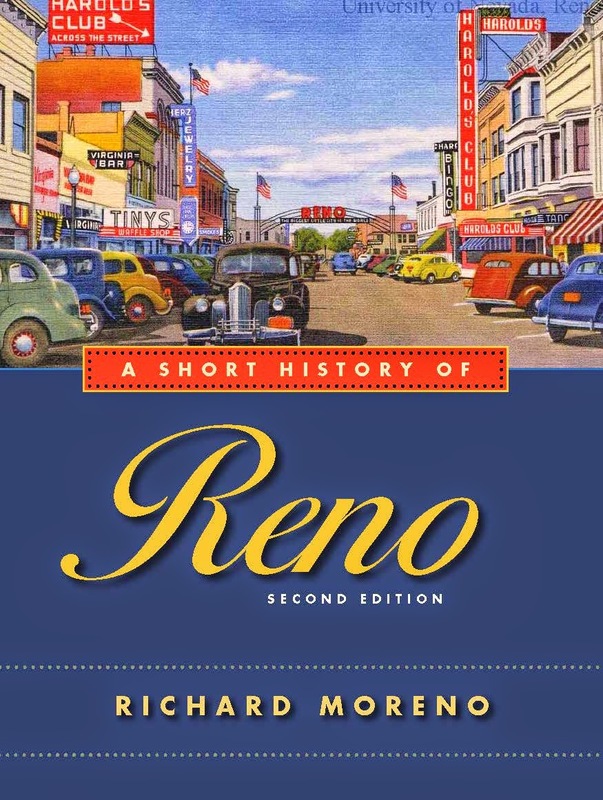 Its main source of water was the Truckee River, which flowed into both Pyramid and Winnemucca lakes via a natural slough at the south end of both bodies of water. Following construction of Derby Dam on the Truckee River in 1905, water that once flowed into Winnemucca Lake was diverted for irrigation. Within a couple of decades, Winnemucca Lake, which was once as deep as 87 feet, completely dried up. In 1962, the lake lost its national refuge status. Today, it is little more than a dry, alkali lake bed. 4. In 1958, the Nevada State Park Commission developed a list of ten future state park sites. Included was the Beowawe Geysers, an extremely active geothermal field located about 45 miles west of Elko. The Beowawe Geysers had long been recognized as one of Nevada’s natural wonders. A 1930s study noted that several of its geysers regularly erupted to heights of several feet and one to more than 12 feet. Until the 1970s, the Beowawe field was the second most active geyser basin in North America (after Yellowstone). However, starting in the late 1950s, energy companies began drilling wells at Beowawe to develop the site as a geothermal power source. By the 1970s, the Beowawe Geysers had ceased to be active as the hot underground water was being diverted for power generation. Today, the second largest and most active geyser field in the country is quiet. Steam still rises from vents and cracks in the ground but the geysers are no longer active. A couple of years ago, someone asked me if I had ever seen any giant fiberglass cow statues in Nevada. I racked my brain and recalled that I’d seen one in front of a café in Currant, a wide spot in the road at the intersection of U.S. 6 and State Route 379. I don’t know if the Currant cow is still there but it all got me thinking about all of the weird fiberglass or plastic statues that have been erected throughout the state. In nearly every case, the oversized object d’ art was put up to promote some kind of business. The list gets even longer if you look at giant neon sign objects like Wendover Will and Vegas Vic, the pair of electronic cowboys that grace Wendover and downtown Las Vegas. • One of the most famous of the bigger-than-life statues is “Last Chance Joe,” the 36-foot plastic prospector perched atop John Ascuaga’s Nugget resort in Sparks. The cartoony Joe, who has been scheduled to be removed for a couple of years because he doesn’t blend in with the city’s redevelopment effort, was built in the 1950s. No word on when he might actually be removed from the resort. • A former companion of Joe’s is the giant prospector that now stands adjacent to the Chocolate Nugget candy factory in Washoe Valley. While I’m not sure of his name, the massive gold miner originally kneeled on top of a long-gone casino in downtown Sparks, across from Joe. In the 1980s, the 20-foot fiberglass sourdough was relocated to the lot next to the candy shop. • There are a couple of other prospectors—they’re shorter at about 15 feet tall—who can be seen kneeling while panning for gold in the parking lot at the Gold Strike Inn in Jean. • Travelers to Elko will find a couple of about 20-foot tall plaster polar bears wearing cowboy hats that stand above the two main entrances to the Commercial Hotel. The faux ursines, which carry the name, “White King,” are actually replicas of a real, mounted polar bear that is on display inside the casino. The real White King is considered the world’s largest polar bear. He stands 10-feet, 4-inches tall and, when alive, weighed 2,200 pounds. He came to Elko following a challenge in 1957 to find the largest polar bear in the Arctic Circle. The bear was shot by an Eskimo in Alaska on an unknown date and purchased by Red Ellis, former owner of the Commercial. He was trucked in one piece to the casino, placed in a display case in 1958, and hasn’t been moved since. • Yet another fiberglass bovine can be found standing alongside State Route 373, the road through the Amargosa Valley area. This black and white cow, which stands about 8 to 10 feet tall, apparently once stood on top of the Holy Cow Brewery in Las Vegas. She (it has udders) was retired to the southwestern Nevada desert sometime in the 1990s. • A newer example of the larger-than-life school of art can be found on the façade of M&M World on the Las Vegas Strip. There, you’ll see a pair of brightly colored, smiling, round M&M characters welcoming visitors to the attraction. Tucked between them is a giant bag of the candies with large replicas of the coated chocolate pellets falling from a torn end. • Las Vegas is also home of a giant plaster replica of the Egyptian Sphinx, positioned at the front entrance to the Luxor Resort. Between the paws of the regal monolith is a smaller statue of an Egyptian pharaoh. The Vegas Sphinx is reportedly ten stories high and 265 feet long—making it about 35 feet taller and 25 feet longer than the original. • While it’s not made of plaster or plastic, another impressive casino statue is the 45-foot tall, 100,000-pound bronze lion at the entrance to the MGM Grand in Las Vegas. This shiny, muscular feline was erected a few years after the resort opened to replace a more cartoon-like lion façade that had been built at the hotel’s entrance. Apparently, some Asian gamblers avoided the casino because it is considered bad luck to enter through a lion’s mouth, as was originally the case. There are a couple of fun web sites devoted to these kinds of giant statues and other roadside attractions including, www.roadsideamerica.com and www.legendsofamerica.com.